Do you hate packing? Whether you often take short business trips or go on weekends away with your partner, having a bag that is just the right size to fit your belongings makes all the difference to your journey. Nobody wants to be lugging round a huge suitcase, nor do they want to crease up their work clothes in a tiny little backpack, which is why we’ve rounded up our top picks for men’s weekend bags that allow you to travel with comfort and style. Before just picking one that looks good, think about your journey and what you need from a bag. If it’s for regular use, then you’ll want to invest in something that’s sturdy and won’t break halfway into your journey, and if you’re travelling a distance, then a bag on wheels could make things much easier for you. If you carry a lot of valuables, opt for bags that are durable and have a locking system for that added reassurance when travelling via public transport. Style does of course play a role in what you consider the best men’s weekend bag for you, and we think we’ve found a good variety of style options to suit every kind of traveller. If it’s for business you’ll want something neutral and professional looking, so opting for leather or tailored options is a good choice. Bags with compartments for gadgets such as laptops are also handy when travelling for work. If it’s a weekend away with the lads or a sporting holiday, then there are a range of duffel bags around that will have enough room for all your essentials and come in a range of styles to suit your tastes. Remember to check the size of the bag if you want to use it as a carry on for flights. This is where small cabin wheelie cases are a safe option to abide by aircraft guidelines. A good bag will set you back around the £100 mark but if you’re travelling frequently, this will prove to be better value for money. If you just need something for short trips every now and then, you can find some stylish bags for a lot less that will get the job done nicely. If you want a ‘one bag suits all’ then this Fred Perry Barrel Bag is the perfect bag for business trips and holidays. It’s stylish and affordable, and although it doesn’t have a huge capacity, you’ll fit all your essentials in while looking the part. The overnight bag has canvas handles and an adjustable shoulder strap for comfort when on the move and plenty of compartments for easy packing. The PacSafe Intasafe Duffel is the ultimate theft-proof bag with Roobar Locking Systems on the zips and an anti-slash strap which stops pickpocketing and cut and run thefts. This is great for using when travelling in an airport or on public transport where you may have to leave your bag out of sight for a period of time. It is also ideal for events such as festivals to ensure all your belongings are kept safe while in big crowds. If you frequently travel for business, then this Samsonite Rewind Laptop Backpack is a great investment for all forms of travel. It has a dedicated laptop sleeve and interchanges between a wheelie case and backpack for when you’re in different areas. It’s the perfect sized cabin bag for those who take regular flights but be careful not to over pack your gadgets otherwise there’s no room left for clothes. For those frequent flyers, this Briggs & Riley Transcend Clamshell Cabin Bag is one of the best men’s weekend bags for cabin allowance. This bag is great for those who love to stay organised as it has many pockets and sections for easy packing. Flying with hand baggage only has never been so simple and you’ll really look the part with this business style bag. Although expensive, this overnight bag will stand the test of time and comes with a lifetime guarantee. If you tend to come home with more than you took, then the Go Travel Adventure bag is the perfect solution. This is a compact and foldable bag that is easy to store out of the way when not in use. At just £12.99 this is the perfect overnight bag with a large capacity to fit your essentials in. It is cabin approved but won’t last as long as some more expensive bags on the market. For lovers of all things traditional, the Leathario Leather weekend bag is a sturdy choice for the travelling businessman. Made from quality **Material**s, this men’s weekend bag is a simple design that is reliable in both aesthetics and functionality. However, the leather can become tarnished if exposed to sunlight for a prolonged period of time, and it can be tricky to clean. There are studs on the base to protect the bag from getting damaged and its quality should mean it stands the test of time. If you’re someone who struggles to pack light then this large capacity bag will ensure you have everything you want when on your travels. This bag has backpack straps for easy transportation and is completely weatherproof making it ideal for camping trips or hiking on rainy days. You’ll also get a choice of colours and patterns making it a great unisex bag, too. What’s great about the Herschel Supply Novel Duffel Bag is that is has a separate shoe compartment which is great for sporting weekends away or carrying a pair of smart shoes without getting your clothes dirty. It is a smart bag that would be perfect for work trips and holidays and is lightweight making it one of the best weekend bags for men as it’s easy to carry. Although a little on the small side, if you’re good at packing light then this bag is great value for money. For men who love all things traditional, this Waxed Cotton holdall has a tartan inner lining that adds to the heritage feel that will stand the test of time. It comes in a beautifully smart brown colour with grab handles and a shoulder strap for easy transportation. 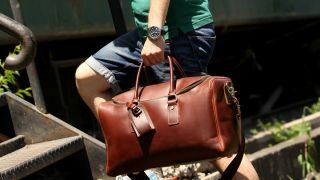 This men’s weekend bag would suit all styles and is perfect for both a business trip or for a city break or golfing trip.